At Grand Dad's Lures, they handcraft only the highest quality top water lures right here in USA. 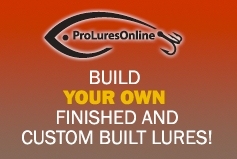 Located in Glen Saint Mary, FL they have ties in both the North and the South.They are very proud to be one of the few remaining American Lure Makers. They started this business with the vision to handcraft and reintroduce the lures of our forefathers, using today's technology. GrandDad's Lures provides a high quality product, a bait you can pass down.